Original blue cloth. 19th-century stamps of Otis Fish on endpapers. Inner hinge neatly restored, minute touch-ups to spine ends. An excellent copy. Half morocco case. A splendid copy of Tom Sawyer, one of the first great American boy’s books. This is the first American edition, first printing (on wove paper and with half-title and frontispiece on different leaves). “Tom Sawyer was the first printed story of a boy in which the hero was recognizable as a boy throughout the whole narrative … until Tom Sawyer was written, nearly all the boys of fiction were adults with a lisp, or saintly infants, or mischievous eccentrics … in the work of Dickens there were hints of boys that were boys; but Tom was the first full blown boy in all fiction … the book is a landmark” (Booth Tarkington). This novel of a boy growing up along the Mississippi River is set in a town called St. Petersburg, inspired by Samuel Clemens’s hometown of Hannibal, Missouri. The author may have named Tom after a San Francisco fireman whom he met in June 1863. The real Tom Sawyer was a local hero, famous for rescuing ninety passengers after a shipwreck in 1853. The two were friendly during the author’s years in California, often drinking and gambling together. Twain referred to the real Tom Sawyer in Roughing It, but in later years he claimed that he himself was the model for Tom and that “‘Sawyer’ was not the real name … of any person I ever knew, so far as I can remember” (see Smithsonian, October 2012). 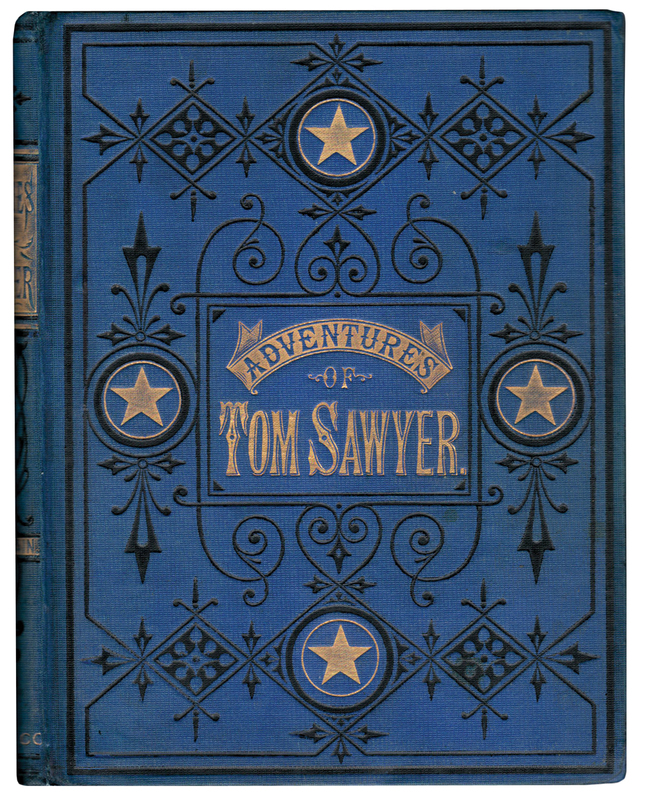 Tom Sawyer is among the most difficult of the great 19th-century American novels to obtain in collector’s condition. This is a lovely copy. Grolier 100 American Books 79.